Slowing global economy means turbulence still likely. 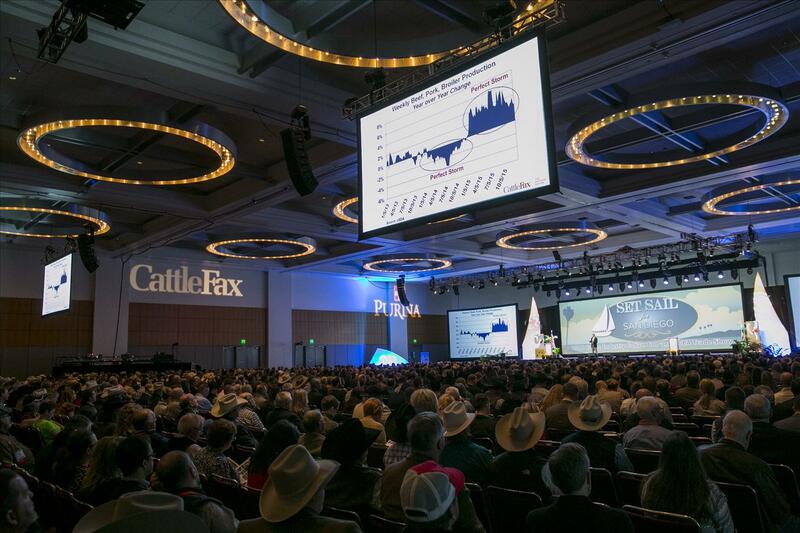 Insights about the recent market price shocks and potential for future turbulence were discussed this week with more than 2,000 beef producers at the CattleFax Outlook Session held during the 2016 Cattle Industry Convention and NCBA Trade Show. The downward spiral from the record-high cattle prices of late 2014 and early 2015 has been tough for many in the business, but CattleFax chief executive officer Randy Blach said the steepest portion of the market correction has passed. According to Blach, cattle markets had the third-largest rally (37% in 15 months) from 2014 to 2015, followed by the third-largest break (32%) in the last 12 months, which is a pretty fast change at a very fast pace in a very, very short period of time. “We’re measuring it from a percentage standpoint, but a lot of you feel it from a dollars-per-head standpoint,” Blach said. He explained that tighter protein supplies and stronger exports created the "perfect storm" for the cattle market to reach the extreme highs. Animal health challenges limited poultry and pork production in 2014, creating the tightest per capita U.S. net protein supply in the last 20 years. This resulted in the second most volatile market in history — one that was more volatile than the market following the discovery of bovine spongiform encephalopathy in 2003. He said the markets are currently trading where they should be but added that the volatility and the way the markets are moving to those levels is what’s creating concern within the industry. Analysts predicted that cattle feeders – after losing about $200 per head in 2015 – will be slightly profitable this year. Stocker operators will experience tighter margins, and cow/calf producers will remain profitable. The team of economists expect fed cattle prices will average $130-135/cwt. in 2016. Analysts predict exports to add $294 per head in value for 2016 – a $66 drop per head from 2014 values. This decrease in export potential is caused by a combination of a stronger U.S. dollar, a slowdown in global markets and challenges with market access. China and other global markets are still the biggest opportunities for U.S. beef, but trade restrictions will continue to limit potential in the year ahead. Blach said 2016 and 2017 are forecasted to top the record meat production of 2015, which means exports will be key in the future. Beef imports are projected to be down 8% due to the combination of lower trim prices and increasing domestic cow slaughter. The U.S. is in a rebuilding stage, and females are being held back for the cow herd. Analysts predict that the U.S. cow herd will grow another 600,000 head in 2016 following a 1.1 million-head increase in 2015.